The Spin and Win Casino was established in 2011 and is operated by Daub Alderney Limited. It is an online casino with a vast list of online games, a good customer service and bonuses and promotions for new players and existing players too. Since 2011, Spin and Win Casino has been providing the best online casino games from slot games to table games to live dealer games. The casino has the best gaming software being provided by IGT and NetGen software providers. Players can be assured of a good gaming experience in this casino. Spin and Win Casino has three progressive jackpots which include; The Luxury Jackpot, Dream Chance Jackpot, and The Tasty Jackpot. These progressive jackpots offer players life-changing money prizes. They have 5 reels’ slots and 5 lines and a 97.02% return to players. Spin and Win casino has the best online slot games with over 200 slot games, players are assured of a good online slot casino experience. The casino’s game providers ensure that the players enjoy every moment of playing the online slots. The slot games include; Center Court, Rugby Star, Gold King, Cleopatra, and Da Vinci Diamonds among others. The casino has an awesome list of table games to satisfy every player’s taste. The casino has tables and card games. Some of the games include; Mini-Baccarat, Jacks or Better, Deuces Wild, Double Exposure, and Beat Me among others. Spin and Win Casino provides live dealer games so that players can enjoy the real casino experience from the comfort of their home. The dealers are friendly and always ready to explain the rules and chat with players if need be. The live games include; Roulette (French, Automatic and La Partage), and Blackjack among others. The casino offers a 100% bonus of up to €500 and a 100 free spins with a wagering requirement of 30x to players who are looking to join the casino. 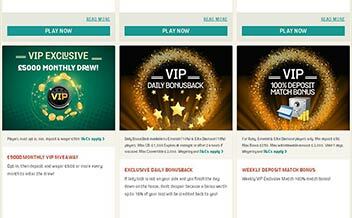 New customers also have a 2nd deposit offer of 100% bonus of up to €250 and a 100 free spins. The last welcome deposit bonus offered by the casino is the 100% of up to €250. The free spins are usually given in 20 rounds for 5 days, usually done after the deposit is processed, the wagering amount is 25x and a winning of up to €50. Keeping up with the latest information regarding promotions and bonuses offered by any casino is crucial to anyone looking to be a regular player. For this reason, we created this section to provide readers with the latest information about Spin and Win Casino. Keep visiting this section to stay up to date. Spin and Win Casino has a nice outlook. The software providers include; Eyecon, Play’n Go, Microgaming, IGT, and Bally among other. These software providers are known for their vast variety of games that they provide casinos with. The famous slot games are best known for this casino and the software providers ensure that players get to enjoy the online gaming experience. The casino is constantly coming up with new games for its huge clientele. Instant play, download and mobile. United Stated, Australia, South Africa and many others. UK Pound Sterling, Australia Dollar, European Euro, Canada Dollar. 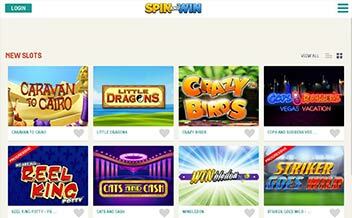 Spin and Win Casino is maintained by various platforms and devices. Desktop, mobile and tablet users can access the casino site. Operating systems like Android and iPhone devices are also supported. The Spin and Win website has a pretty clean interface with a blue and green color on the background. There is no pop-up adverts on the web page hence the players are not troubled as they are navigating through the site. The colorful website attracts the players to join the casino. The software needs constant updates from time to time. This version requires a lot of data to operate. Spin and Win Casino mobile version supports Android and iPhone operating system devices. The mobile version is also easy to use as players are able to access the casino games easy and on the go at the palm of their hands. 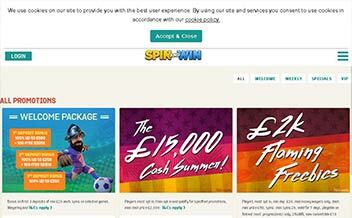 Spin and Win Casino prides itself on ensuring that their customers’ details are secured. The casino has the best security encryption for their clients’ transactions and is licensed by the UK and Alderney gambling commission, therefore players can be assured that Spin and Win Casino is legit. The casino offers the best customer support providing a telephone number and email address. It also has an instant message task where players are accorded speedy assistance by the polite staff of the casino. The customer support is usually available 24/7. Spin and Win Casino has an implausible choice of games and has many software providers that ensure an awesome gaming experience for players. The casino has a good mobile platform and a user-friendly web interface that has players busy at all times. 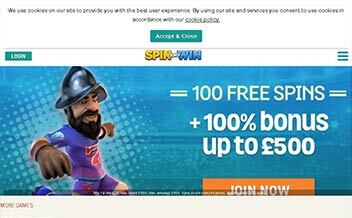 Spin and Win casino is definitely different from other online casinos.